Purple loosestrife is native to Europe and Asia and originally introduced to North America as an ornamental plant. In its non-native areas it is known as the “beautiful killer” because of its ability to completely take over wetlands and displace native vegetation. **Purple loosestrife can be commonly confused with Alaska’s native Fireweed. To tell them apart, Fireweed typically does not grow in wet or saturated soils, has narrow, lance-shaped leaves and the stem is not square. Purple loosestrife was once available for purchase in nurseries and garden centers throughout Alaska up until 2007. Because of its aggressive growth habit, it has the potential to escape gardens into natural areas. When it does, purple loosestrife can suppress the resident plant community and eventually alter the wetland structure and function; clogging streams and canals, slowing water flow, shading out native plants and degrading nesting and forging sites for native animals. If this plant has an opportunity to establish in Alaska, economic value of our precious water resources could significantly decrease. Purple Loosestrife has been found in several gardens in Anchorage and Juneau. One infestation was found in a natural area along Chester Creek in Anchorage and has since been eradicated. This map depicts the sites were it has been found in the past. These sites are still being monitored, but have since been eradicated of purple loosestrife since 2011. Since its listing as an Alaska noxious weed, purple loosestrife is no longer available for purchase in the state, and it is illegal to transport. Habitat: Moist or marshy sites, stream banks, shorelines and shallow ponds, typically favors clay, sand and silt. Early Detection and Rapid Response (EDRR)! Controlling the spread of purple loosestrife is crucial to protecting fish habitat, wildlife, and native plants. If found, please call 1-877-INVASIV. The best time to control purple loosestrife is in late summer when it is easily recognized by its purple flowers, but before it goes to seed. Diggings, hand-pulling and cutting are best used for managing small infestations and have been successful, such as the Chester Creek infestation in Anchorage. The roots of purple loosestrife have the potential to sprout new plants, so care must be given to remove as much as the root system as possible. If the flower has gone to seed, take special care to properly remove seeds and prevent them from dispersing by disposing of them in a doubled plastic bag (plant material decomposes faster in plastic). Chemical control has also been effective in managing smaller infestations of purple loosestrife in the lower 48. 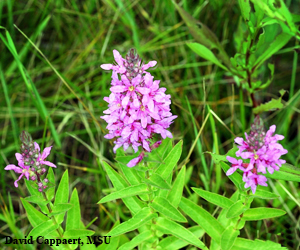 However, biological control of purple loosestrife has been a main method used in Minnesota’s management plan.